Blair, who's stage name was Rover, became famous in history as the first dog to play a major role in a motion picture film. In the dawn of cinema, many silent films were made and many were lost over time making it hard to say when dogs first appeared on film. 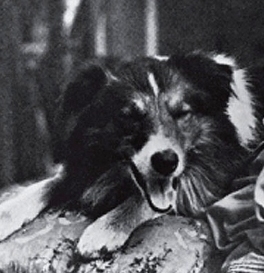 However, the first dog to actually star in a film was a male collie named Blair. 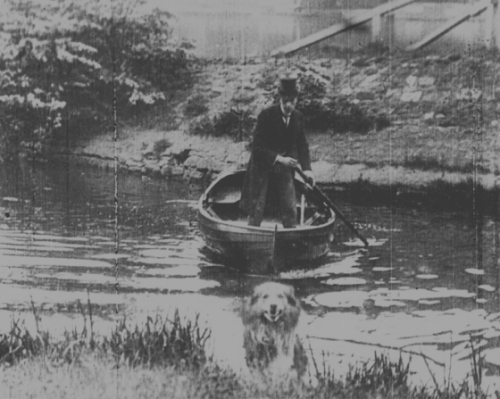 The dog's first appearance was in a six and a half minute film called Rescued by Rover. It is a 1905 British silent drama directed by Cecil Hepworth, the owner of Blair. The story is about a heroic dog named Rover who rescues the family's baby (played by Hepworth's daughter) that was kidnapped from the nanny by a drunken beggar woman. Most of the footage is devoted to the dog's journey in finding the baby then leading his master (played by Hepworth) to the baby. Hepworth's wife wrote the scenario and also acted as the mother in the film. The film became so popular that Hepworth had to re-shoot the entire film twice to keep up with demand. So many prints were sold that the negatives wore out requiring the film to be re-shot. It was after this film that the uncommon name of Rover became one of the most recognized names for dogs in the English speaking world. 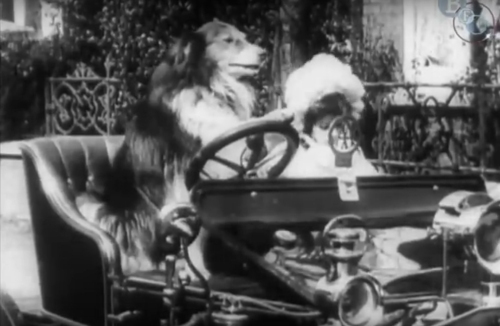 In 1908 a sequel was made called The Dog Outwits the Kidnapper. This time Rover finds the little girl sitting in the kidnapper's car by herself. The dog jumps into the driver's seat and drives her back home to the safety of her mother's arms. When Blair passed away the film company put out a newsletter which announced "The Hepworth Manufacturing Company has just suffered quite a severe loss in the death of their famous old dog Rover. This faithful animal had been Mr. Hepworth's constant companion even before the Hepworth Company had been founded, and was the general pet of the studio at Walton-on Thames. He was the first animal to play an independent part in a cinematographic film and was the hero of many pictures. Many others beside the Hepworth Company will deplore the death of this old favorite."